Back to the Burda pattern 9772, this time made up in stretch Denim. Again I made size 3 and this time view A with the knee patches. Meg at New Threads Quilt Shop supplied the pattern, fabric and Bib & Brace closure for the straps. I provided the thread, a small piece of interfacing, the applique, some elastic and my time. 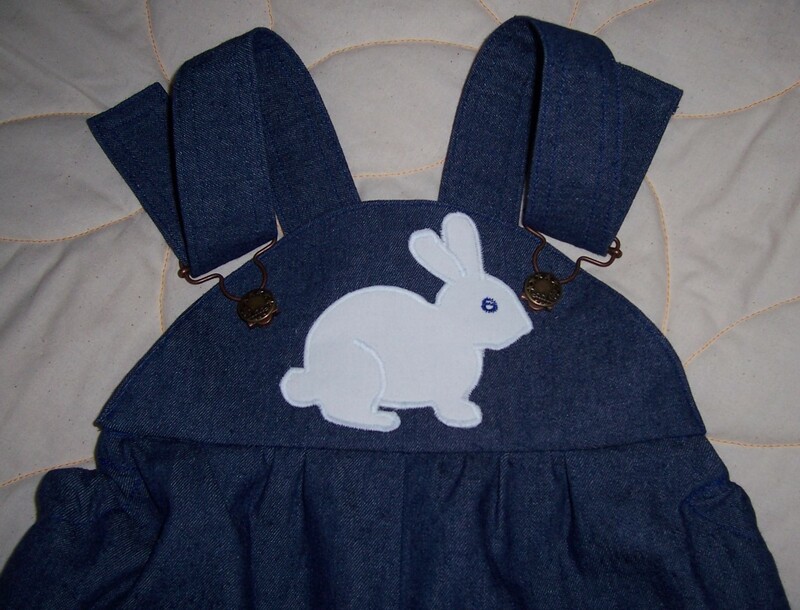 I used an outline from the internet to make the White Rabbit applique on the bodice which is satin stitched in White with a Blue eye. Taking advice from Meg, I used elastic casing all around the hem of the legs. 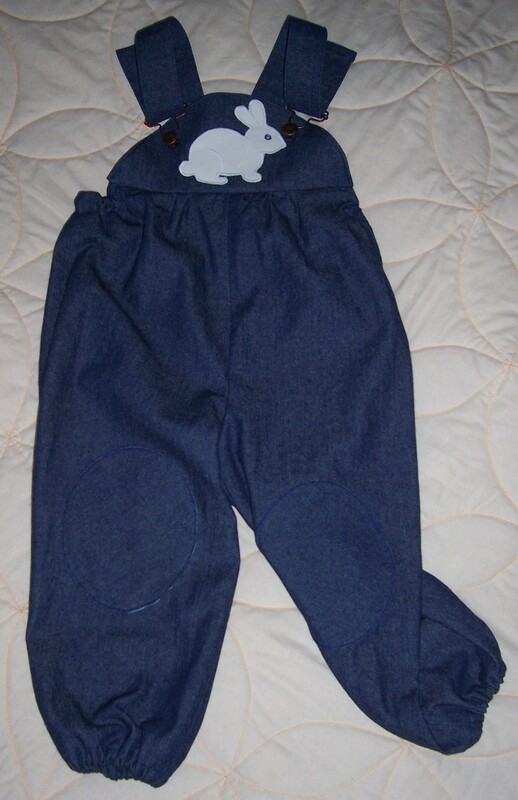 If the child is short then there will be a little more “blousing” in the trousers but as they grow, the blousing will reduce. Built-in room for growth! The knee patches are cut on the bias. The instructions in the pattern suggest that you leave a raw ” frayed” edge but I went “off plan” by lining them with a cotton print, turning through and then top-stitching in place. Top stitching was made in co-ordinating Blue. 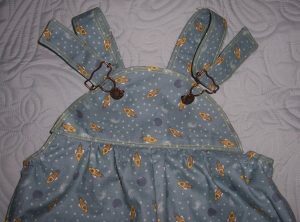 The straps had seam allowances pressed under before top-stitching in place thus I avoided having to turn the straps through which took a long time on the previous set of dungarees. Having sewn the pattern before I am now more confident and this set took just 3 hours to complete. Following the making of a pair of Dungarees to Burda pattern 9772 I have completed the co-ordinating shirt using Burda 9792. 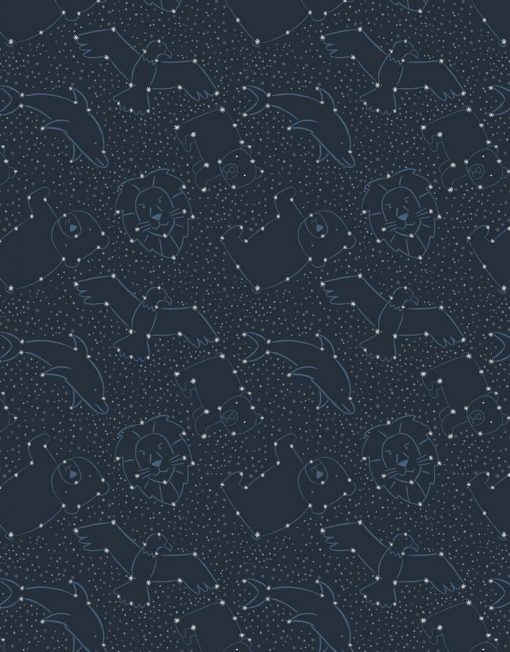 This is a sample shirt to promote the pattern, the fabric which is from Lewis & Irene’s range “To the Moon and Back” and a workshop to be held in 2017. Meg at New Threads Quilt Shop supplied the pattern, fabric and a set of buttons whilst I provided the thread, a small piece of interfacing and my time. 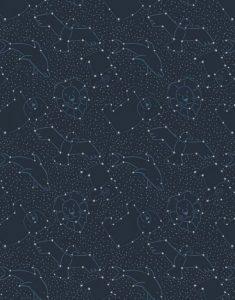 Using the cotton with a delightful print of Constellations I prepared the pattern and made up view B which is the simplest of the options available from this pattern. Other options include pockets, short sleeves with cuffs and tabs or a long sleeved version. I made size 3 which is the second smallest size in the pattern that is sized from age 2 to age 6. Whilst making this darling shirt I was reminded of nearly 30 years ago when I made a similar shirt for my nephew using a print featuring tractors. Even now James is still mad on cars and machinery! 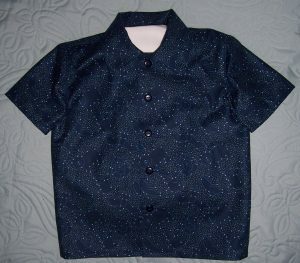 The shirt took approximately 4 hours to make but that included several steps not covered in the Burda instructions e.g. stay stitching the neckline, overlocking all seam allowances and lots of top-stitching. 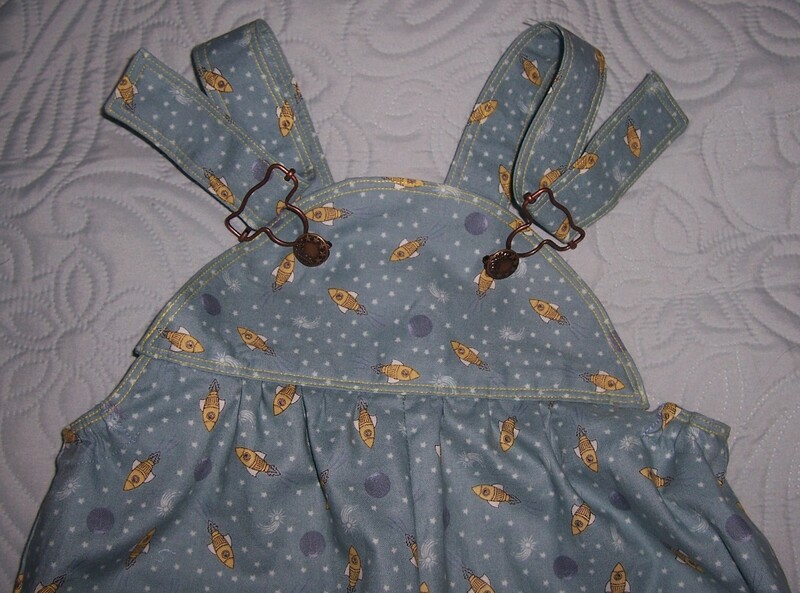 I have enjoyed making these “small” garments but now I would like a change of pace and to go onto something much bigger – a dungaree dress for me! 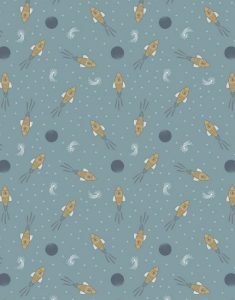 I will be using a PDF “Cleo” pattern from Tilly and the Buttons and some Light Blue denim so watch this space. 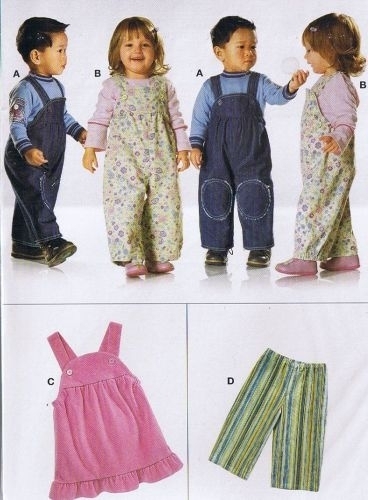 In order to promote a new range of Lewis & Irene fabrics named ”To the Moon and Back” and a workshop to be held in March 2017, I was asked to make a sample set of Dungarees using Burda pattern 9772. Meg at New Threads Quilt Shop supplied the pattern, fabric and Bib & Brace closure for the straps. I provided the thread, a small piece of interfacing, 8 inches of elastic and my time. 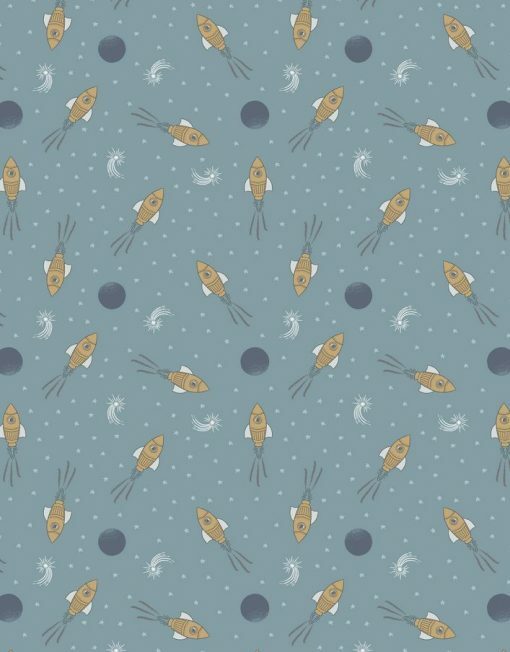 Using the cotton with a delightful print of Yellow Space Rockets on pale Duck Egg Blue, I prepared the pattern and made up view A but without the knee patches or elastic in the cuffs of the legs. I made size 3 which is the largest size in this pattern that includes a pinafore dress and elasticated waist trousers. I top stitched in Yellow to co-ordinate with the print and after approximately 4 hours I had completed the dungarees. About ½ hour of that time was spent trying to turn the straps and also to work out how to apply the bib& brace fixtures! But all sorted now and next time I will turn the straps using a short length of dowelling. The next project is a co-ordinating boy’s shirt using more of this lovely cotton print and Burda 9792.